← Core support from an Alexander point of view…. 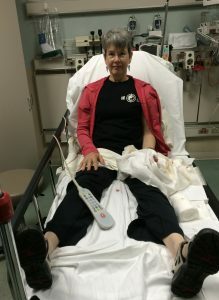 This blog is inspired by two of my excellent colleagues: Jeanne Barrett in Seattle has written movingly about her long recovery journey following a severe knee injury. Brooke Lieb wrote a terrific post just the other day about using the Alexander Technique to recover from trauma after being bitten by a dog. I thought, OK, I’m ready to tell! A little more than a year ago, I had one of those bad split seconds. I was using a very sharp knife and I slipped. The knife went all the way through my left hand, between the metarcarpal bones just below the 4th finger and pinky. It could have been a lot worse, but as it was I nicked a tendon and apparently sustained some nerve damage. Suffice it to say, it was a terrifying experience for a person who needs a great deal of sensitivity and facility in her hands to do her work. And to play the piano. I remember leaning over the sink, with shock beginning to set in and ‘WHAT HAVE I DONE’ blazing through my being. I have a wonderful husband, who reacted with clarity and competence. There were 7 hours in the emergency room, where I had an extended chance to begin applying what I know from the Alexander Technique. I acknowledged where I was and what state I was in. I used my skills of attention and intention to allow the doctors to do their work. I asked myself to not hyperfocus on my hand, but to ‘rise to my observation deck’ and stay spatially aware. I asked myself to refrain from tightening in a way that would interfere with their work and with my overall condition. I didn’t need to add to my own pain and stress, by resisting what was happening via indulging in self-recrimination (and believe me, I can be a pro at that one). Or via the physical form of resistance, tensing as if to hold back from/ push the whole thing away. I’m a firm believer in pulling in all resources. I have a friend who does a lovely form of energy work. She came over and held my hand for an hour for the first three days, an enormous help. I love tai chi and was lucky that I could practice my long form every day. That afforded me a remarkable experience that I’ll describe below*. I received invaluable work from my colleagues. My Alexander skills came completely to the fore: staying present, asking myself not to tighten, asking myself to open to my full physical volume, asking for mobility and flow through my entire self. I’m convinced that my combined resources, layered on the foundation of my Alexander training, spared me a great deal of pain. It’s amazing to watch the soft tissue heal. Such clever bodies we have. I did my best to stay out of the way of the system performing its own repairs and to facilitate the process as best I could. I began my own therapy immediately, initially with quiet intention, asking for mobility as soon as possible. I consider the piano to be my most exacting physical therapist. It informed me exactly what kind of damage had occurred to my hand (non-dominant). It indicated where I would need to ask for greater mobility, more engagement and much more precise facility than in less complex activities. At fir st I just sat at the piano, and draped my fingers over the keys. I couldn’t even begin to put the pinky down, but I imagined the easiest possible action of my finger depressing the key, as I directed my whole self, all the way from my feet on the floor. I asked the direction to extend out clearly through all my fingers, ‘lighting up’ the action through 4th and 5th fingers on the left. Interestingly, as all pianists know, those fingers are less agile anyway, as they share a tendon. This seemed to be an opportunity to upgrade the skill set of these somewhat less able members of the team. 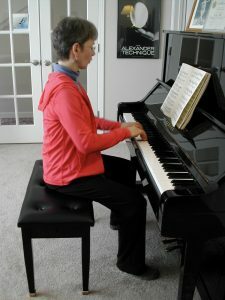 Day by day, I was able to do a bit more and my piano-shaped PT informed me clearly exactly where I was and where I needed to go. I set other little goals. First to get my 4th and 5th fingers to approximate. Then to do the Mr Spock ‘live long and prosper’ gesture. Each goal led to a new one. Anyone going through rehab is very familiar with the process. You keep flirting with the edge of the pain. If you’re a student of the Technique, you know that keeping a free open head, neck and back relationship makes it much easier. I found myself in a very quiet, clear place of greatly amplified mindfulness. I returned to teaching a week after the injury, unable to do many things I would normally do in lessons. Yet I believe I was teaching at a much better level, as I had to rely entirely on the most subtle and powerful aspects of Alexander Technique, the ability to non-do (refrain from any slightest tendency to push, try or force) and to direct (allowing clear spatial intention to inhabit my whole self). So now it’s over a year later and I can pretty much do everything I need to do, which shows just how lucky I was. I’d hoped to escape without nerve damage, but I didn’t. Nerves heal very slowly, so perhaps the nerve damage that remains will heal with time. In any case, I’ll joyfully anticipate the possible and accept the reality. The whole experience has once again proven to me what a powerful ally the Alexander Technique is in dealing with and recovering from an injury. That’s just one of the many gifts it can give us. *If you’d like to read it, here’s my tai chi story: the day after my injury, I was going slowly and mindfully through the lovely version of a long Yang form that I learned from the great teachers at the Twin Cities T’ai-Chi Ch’uan Studio. I was a long way into the form when I began trembling violently and breathing in a labored manner. I was initially frightened and then had a clarion realization that something was trying to move through me and that I had best let it do its work. I did my best to continue while shaking and breathing like a freight train. My eyes closed themselves and I had the powerful sense of being taken over. My left hand started to sparkle – that’s what it felt like — as if it were surrounded by a shimmering light. I got all the way through the 150 postures, then lay on the ground shaking and feeling waves of gratitude course through me, gratitude for all my teachers and for everything I’ve learned. I felt positive that I would heal perfectly. Then I felt a radiant calm. I stood up and felt like I’d had a fabulous Alexander lesson. What exactly happened? Who knows, but if I had to describe my hunch, I’d say that the mysterious chi force decided to move the trauma out of my system, then and there. And it left me. It brings tears to my eyes just remembering it now. **My tai chi journey began with Richard Son Su Meyer. I continue to learn from him. Great story, Tully. Our work is so amazing, and we benefit as much if not more than our students. What a gift, and so glad you are healing so well. Thanks for the shout out! Tully, Yours is an amazing story and beautifully articulated. Just as people who eat nutritiously and judiciously are able to deal with many illnesses more easily, you have demonstrated how having the skills of the Alexander Technique before an event can benefit in recovery from injury. Thank you. I mention your book Living the Alexander Technique frequently, as it provides so many examples of older titans of the Alexander teaching community using AT in such gentle and enlivening ways to help them deal with the multiple challenges of advanced age and various health issues. One basic theory of Somatic Experiencing is that in trauma healing the body needs to complete what didn’t get to happen in the traumatic event. In animals it is common to observe tremor and shaking after the shock and death-like stillness are over; the nervous system moves the shocking experience and impact through the body by way of shaking. In the Alexander Technique we have not the most ideal access to completing the trauma response to this point, because our practice of inhibition as non-reacting can have the effect of freezing; parts of the the trauma experience can get stuck in the body. I am so glad you told this story! And that you healed so well. A really interesting observation, Michaela! My brilliant Rolfer friend in Orlando, Robyn Martin, also mentioned how animals shake after a trauma, then seem to be free of it. That is certainly what happened to me. I’ve noticed that one of the things I get to inhibit (in the AT sense) is the tendency to over-control. Sometimes that means that trembling wants to emerge and I should let it. AT is indeed deeply quieting & can permit flow to emerge. I think the shaking can happen as a result of the deep quieting & opening the channels and should be permitted to manifest, as it wanted to during my tai chi. I gave it full rein then, as it was safe to do so. I credit AT with making me much more available for the ‘chi’ to do its work. (Frankly, I think the energy of AT direction & chi are closely related.) Later in a tai chi class, some shaking wanted to happen again and I could clearly perceive that I could either allow it or decide to not let it have full rein, and that it would be fine to go either way. Tully, thanks for sharing your insightful experiences so eloquently. You are a triumph! I think you did the right thing in continuing your tai chi through the shaking. What would you have learned if you had stopped? You made me think of a remark a commentator on TV made recently about the US swimming phenom, Katie Ledecky (sp)? He said that unlike the other swimmers, she doesn’t slow down when she feels herself near to bursting from fatigue and lack of oxygen. She just keeps going! The others slow down, essentially because of their fear. You kept on rolling, wonder woman! Anybody reading these comments, please obtain and read How You Stand, How You Move, How You Live by Missy Vineyard, if you haven’t already. A lot of what I’ve learned lies therein, gleaned from the source! Gosh, I think I’ll frame it, too! What an experience! As a new student of AT, it struck me as magical, inspiring and empowering. I was delighted to hear that one of your first goals was to form the Live Long and Prosper greeting!